I did a bunch of yard work this morning, so I was happy step six was one I could sit down for this afternoon. My final step, is to do all the finishing, detail work. Most of the time when I paint, it's pretty loose with big strokes, so this final step requires a different patience to go in close and careful and define edges or bring out colors a bit stronger. It's a lot of fine combing and backing up and staring, making sure the end product is what I want it to look like (and nothing looks blaringly off). I try not to overpaint a painting because there are really raw, bold strokes that I find so beautiful when they're not played with too much (like in the trees). But there are other areas (like the wall and pavement) that needed to be lightened up, so they got another layer. I felt like the water was too blue and boring at one point, so I added some more color and then a lighter layer of bluish white on top of that. The kids' swimsuits went through several variations before they landed in these colors. It's funny how much I can play with it and then there's a point where I step back and just call it done. One of my favorite quotes says, "A painting is never finished-- it simply stops in interesting places" --Paul Gardner. This was an interesting place to stop, and now it's time to move on to the next story. 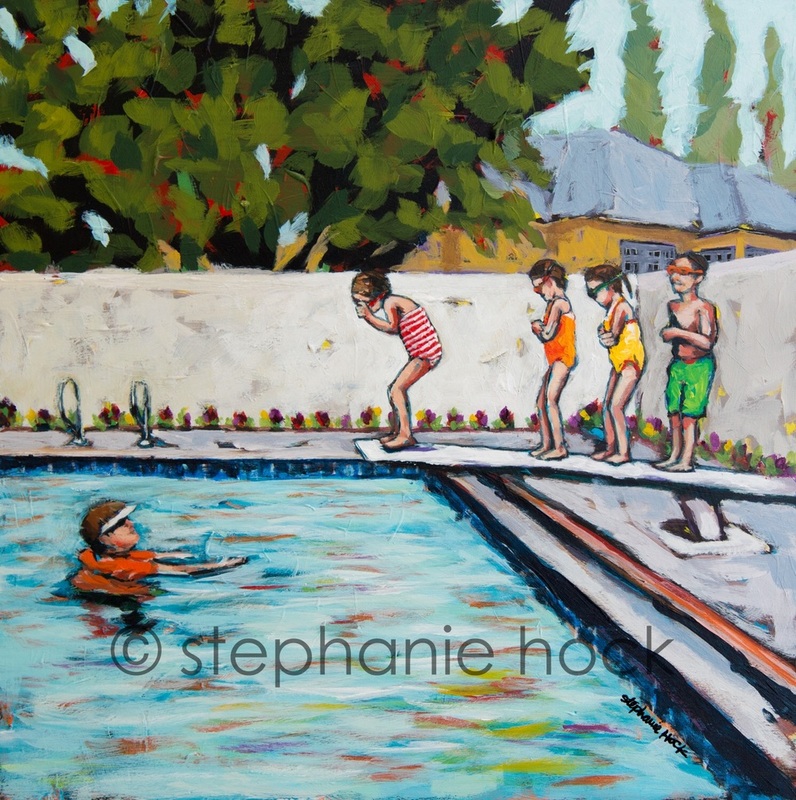 So, I give you, "Swimming Lessons" 12x12 (available in the shop: http://www.stephaniehock.com/originals/). Done!